Outer Space Awaits: A Sci-Fi Escape To 'The Stars' Based on The Count of Monte Cristo, Alfred Bester's saga The Stars My Destination will transport you off the couch and into a roiling world of futuristic teleportation. 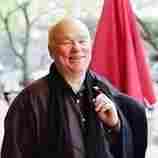 Author John Baxter says the book injects new life and energy into a classic tale. After a fundamentalist religious upbringing in a small Australian town, I didn't think there was anything new to learn about guilt. That was before I discovered science fiction. "Why aren't you outside on such a beautiful day?" said my mother accusingly. "Why are you sitting inside with your nose in a book?" Ah, but what a book! "In a minute, in a minute ..."
I scrunched down even further into the big armchair and turned the page. The hero, Gully Foyle, was trapped in the ruins of Old St. Pat's in New York. The explosion that brought down the ancient church had also scrambled his brain. His senses were tangled: "Sound registered as sight, motion registered as sound, colors became pain sensations, touch became taste, and smell became touch." Desperately, he accessed the hidden power of the human brain to teleport — to move by thought alone. In an instant, he appeared at the top of the Spanish Steps in Rome, an apparition in flaming clothes. And my mother wanted me to leave this to play cricket? 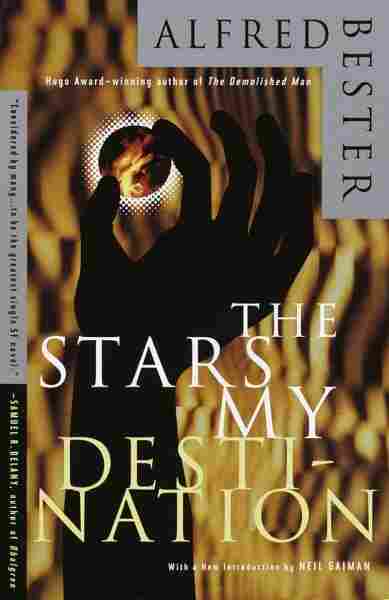 The book was Alfred Bester's The Stars My Destination, published in 1957. Bester wrote science fiction in the mode of Rafael Sabatini, author of Scaramouche, Captain Blood and The Sea-Hawk, and of Alexander Dumas, from whom he ... well, let's be kind and say "adapted" this story. It's none other than Dumas' biggie The Count of Monte Cristo, restaged in the far future, when most people have learned how to teleport. Gulliver Foyle, an uneducated brute, is left to die in a wrecked spaceship. Inspired to greatness by rage, he rescues himself, is put in prison, escapes, finds a treasure, remakes himself as a flamboyant aristocrat and stalks his enemies through a society transformed by the discovery of teleportation into something between Dickens' London and the Borgias' Rome. I still have that old paperback. The paper is yellowed, the binding cracked, but the wonder is unimpaired. At least once a year, I take it down and, furtively, page through it. Hardly necessary, really, since I know most of it by heart. Of course I should be reading something bracingly innovative by one of the new young writers. But it consoles me that the best of them, like William Gibson, hold The Stars My Destination in the same esteem as myself. 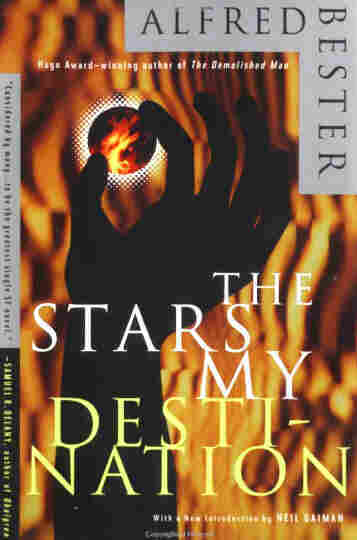 After Stars, Bester didn't write another novel for almost 20 years. There was more money in television and in editing the travel magazine Holiday. We met once, at a writers conference in Dublin. I shamelessly buttonholed him to sign my copy. "In the Royal Marine Hotel," he wrote firmly on the title page, "waiting for a drink." It was no surprise to hear, when he died in 1987, that he left everything to his bartender. If a cocktail can make one write as he did, I wish I'd thought to ask him what he drank. My Guilty Pleasure is edited and produced by Ellen Silva with production assistance from Rose Friedman, Lena Moses-Schmitt and Amelia Salutz. He was one hundred and seventy days dying and not yet dead. He fought for survival with the passion of a beast in a trap. He was delirious and rotting, but occasionally his primitive mind emerged from the burning nightmare of survival into something resembling sanity. Then he lifted his mute face to Eternity and muttered: "What's a matter, me? Help, you goddamn gods! Help, is all." And Terra is my nation. A man of physical strength and intellectual potential stunted by lack of ambition. Energizes at minimum. The stereotype Common Man. Some unexpected shock might possibly awaken him, but Psych cannot find the key. Not recommended for promotion. Has reached a dead end. He had reached a dead end. He had been content to drift from moment to moment of existence for thirty years like some heavily armored creature, sluggish and indifferent — Gully Foyle, the stereotype Common Man — but now he was adrift in space for one hundred and seventy days, and the key to his awakening was in the lock. Presently it would turn and open the door to holocaust. The spaceship Nomad drifted halfway between Mars and Jupiter. Whatever war catastrophe had wrecked it had taken a sleek steel rocket, one hundred yards long and one hundred feet broad, and mangled it into a skeleton on which was mounted the remains of cabins, holds, decks, and bulkheads. Great rents in the hull were blazes of light on the sunside and frosty blotches of stars on the darkside. The S.S. Nomad was a weightless emptiness of blinding sun and jet shadow, frozen and silent. The wreck was filled with a floating conglomerate of frozen debris that hung within the destroyed vessel like an instantaneous photograph of an explosion. The minute gravitational attraction of the bits of rubble for each other was slowly drawing them into clusters which were periodically torn apart by the passage through them of the one survivor still alive on the wreck, Gulliver Foyle, AS- 128/127:006. He lived in the only airtight room left intact in the wreck, a tool locker off the main-deck corridor. The locker was four feet wide, four feet deep, and nine feet high. It was the size of a giant's coffin. Six hundred years before, it had been judged the most exquisite Oriental torture to imprison a man in a cage that size for a few weeks. Yet Foyle had existed in this lightless coffin for five months, twenty days, and four hours. "Gully Foyle is my name." "Deep space is my dwelling place." On the one hundred and seventy-first day of his fight for survival, Foyle answered these questions and awoke. His heart hammered and his throat burned. He groped in the dark for the air tank which shared his coffin with him and checked it. The tank was empty. Another would have to be moved in at once. So this day would commence with an extra skirmish with death which Foyle accepted with mute endurance. He felt through the locker shelves and located a torn spacesuit. It was the only one aboard Nomad and Foyle no longer remembered where or how he had found it. He had sealed the tear with emergency spray, but had no way of refilling or replacing the empty oxygen cartridges on the back. Foyle got into the suit. It would hold enough air from the locker to allow him five minutes in vacuum ... no more. Foyle opened the locker door and plunged out into the black frost of space. The air in the locker puffed out with him and its moisture congealed into a tiny snow cloud that drifted down the torn main-deck corridor. Foyle heaved at the exhausted air tank, floated it out of the locker and abandoned it. One minute was gone. He turned and propelled himself through the floating debris toward the hatch to the ballast hold. He did not run: his gait was the unique locomotion of free-fall and weightlessness ... thrusts with foot, elbow and hand against deck, wall and corner, a slow-motion darting through space like a bat flying under water. Foyle shot through the hatch into the darkside ballast hold. Two minutes were gone. Like all spaceships, Nomad was ballasted and stiffened with the mass of her gas tanks laid down the length of her keel like a long lumber raft tapped at the sides by a labyrinth of pipe fittings. Foyle took a minute disconnecting an air tank. He had no way of knowing whether it was full or already exhausted; whether he would fight it back to his locker only to discover that it was empty and his life was ended. Once a week he endured this game of space roulette. There was a roaring in his ears; the air in his spacesuit was rapidly going foul. He yanked the massy cylinder toward the ballast hatch, ducked to let it sail over his head, then thrust himself after it. He swung the tank through the hatch. Four minutes had elapsed and he was shaking and blacking out. He guided the tank down the main-deck corridor and bulled it into the tool locker. He slammed the locker door, dogged it, found a hammer on a shelf and swung it thrice against the frozen tank to loosen the valve. Foyle twisted the handle grimly. With the last of his strength he unsealed the helmet of his spacesuit, lest he suffocate within the suit while the locker filled with air ... if this tank contained air. He fainted, as he had fainted so often before, never knowing whether this was death. Excerpted from The Stars My Destination by Alfred Bester. Copyright 1956 by Alfred Bester. Excerpted by permission of Brick Tower Press.